Every year the small town across Bull Shoals Lake has town wide garage sales. Its been OK sometimes but other times it is either the dirtiest stuff you’ve ever seen or someone buys commercial things and sets up a show room…not my idea of good sales. It was cold and rainy on Friday and Ron and I had some work to get done at home so we waited until Saturday to go across the dam.. The first place we stopped didn’t look like much but I spied a large jar I thought would be useful in the dye room so I hopped out while Ron kept the motor running…remember it was COLD! That jar was plastic so it wouldn’t do and I thought it was a wasted stop. Then I turned around and under a table was a bin of…….QUILT TOPS. Not vintage yet, but probably from the 90’s judging by the tiny floral calico fabrics used. The lady said her mother was the quilter and she has over 200 finished ones. She begged me to take the quilts for $20 for the entire box. I didn’t take the time to look closely because they had to be worth a few dollars each, right? I whipped out a 20 and the lady stuffed some strip piecing templates, rotary cutter and mat and sewing machine attachments in the box. What a deal. The box had 5 tops in it. 2 were king size, 2 twin/full and one baby. The twin/full ones could benefit from borders to make them queen size. I decided to keep this one and have it quilted. It has a modern quilt look to it. My friend Susan Berres is going to help me baste it. 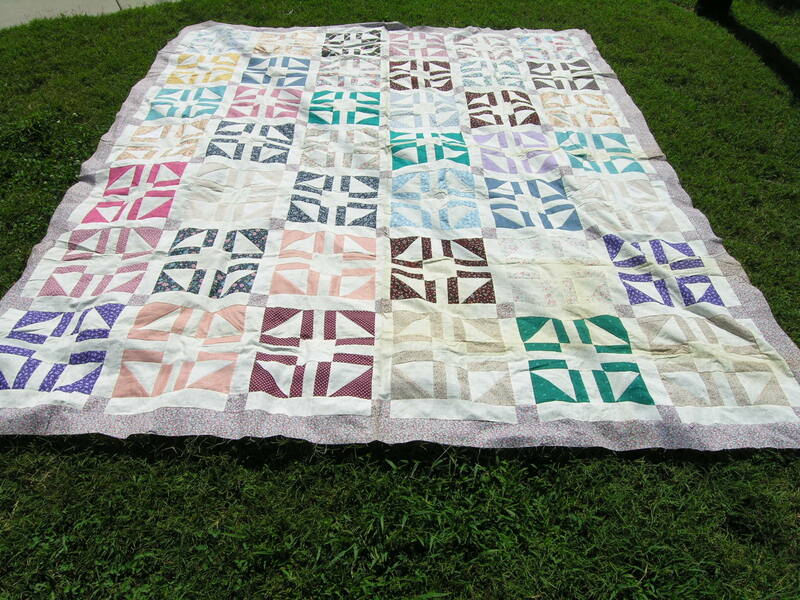 Then I should be able to quilt it on my Sunshine 16. There is nothing as cozy on cold nights as a cotton quilt!